Leeds boxer Jack Bateson is looking to end 2018 on a high as he prepares to headline another card at the Elland Road Pavilion tonight. Super bantamweight Bateson fights Nicaraguan Elvis Guillen over six rounds and will be aiming to move to 8-0, having already had seven professional contests in just over a year. If Bateson defeats Guillen safely – avoiding any cuts or injury – he’s already made plans for another bout just nine days later on December 2. “I can’t wait to get back in the ring again,” Bateson told the YEP. “It’s been a good, hard year for me with seven fights in just over a year as a professional. I’m looking forward to my eighth one now. “I’ve also got another contest scheduled for December 2, again at Elland Road, but that won’t happen unless I get the job done on Friday night. “Nothing is promised at the moment, but I’ve got the opportunity to fight on that show, if everything goes to plan. In his last bout, Bateson won by points decision in his first six-rounder against Scotland’s Scott McCormack and he believes he can take plenty of lessons from the fight. “I thought that I put in a good performance against Scott McCormack, who’s a really tough fighter,” he continued. “I did think that I could get him out of there in the first couple of rounds, but fair play to him for gritting his teeth and sticking with it until the finish. “I’m going to come up against those tough fighters later in my career and it’s good for me to have these tests now. The fighters are only going to get better. 2019 could be the year that Bateson jumps into title contention at domestic level and manager and father, Mark Bateson, believes the key to success is bringing the double ABA champion through at the correct pace. “Jack’s been professional for 14 months now and had seven fights, so he’s moving at a really quick rate,” he said. “At the back end of next year, he’ll be in the title mix. I want him to have another two-to-three six-rounders, a couple of eight-rounders and then, after that, he’ll be ready to go. 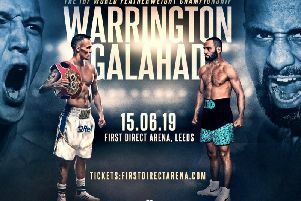 Also featuring on tonight’s bill, former ABA finalist Ismail Khan makes his professional debut whilst fellow Leeds talents Mick Learmonth, Ishmael Davis and Billy Pickles aim to maintain their unbeaten records.